DARRAGH BYRNE WAS just five days old when he died at the Coombe University Hospital on 19 February 2013. His mother, Maree Butler, had had no complications during the pregnancy or reason to suspect that her child would not survive after being born. Last week, a verdict of medical misadventure was returned at an inquest into Darragh’s death. “Darragh was born on Friday, and we didn’t get to touch him until Monday when when he was being christened and at that stage Darragh was dying,” Maree told RTÉ’s Today with Sean O’Rourke. They’re so preoccupied in trying to give him the best care possible that you’re not allowed touch your baby. Darragh had been born by an emergency caesarean operation due to complications arising during the birth. “I was lying there waiting for him to be taken out, but little did I know that he had already been taken out of me,” said Maree. My husband had witnessed him being unconscious and being resuscitated on the table and I was still waiting for him to come out – I didn’t realise he’d been born at all. 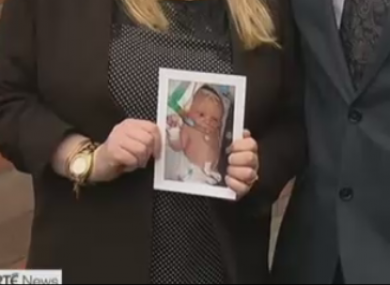 Darragh was taken to the neonatal intensive-care unit. He lived for five days following the birth. He was in a cooling unit incubator for those four days as doctors tried to reduce the swelling in his brain. “We weren’t allowed to take him out of the incubator, we could only touch his little hand through [it],” said Maree. The most perfect, beautiful child you could imagine. “I brought him home in a little Moses basket that we had for him,” said Maree. We had a family gathering… I wanted people to see him and acknowledge that he had been born – that was very important to me. Following Darragh’s death, Maree said that she still had questions. After some time passed she contacted a patient support group to seek answers. She was put in touch with a solicitor and from there her case was taken up. The inquest eventually got underway this year, with the final verdict (that of medical misadventure) being delivered by the coroner last week – three years after Darragh’s death. Maree’s barrister raised the issue that the the drug oxytocin had been administered to Maree to dangerous levels and that a CTG scan (for monitoring a baby’s heart rate) was not readable. The corner said on giving the verdict that he would look at current protocol around the use of the drug Oxytocin as well as electronic foetal monitoring. The Coombe apologised to Maree officially in March of this year. Email “"We weren't allowed to take him out of the incubator, we could only touch his little hand through it"”. Feedback on “"We weren't allowed to take him out of the incubator, we could only touch his little hand through it"”.